The constantly shifting sands of grammar and usage has been a frequent topic on this blog. Punctuation, a major subset of grammar, is a frequent source of disagreement and confusion. The interrobang in Palatino Linotype. 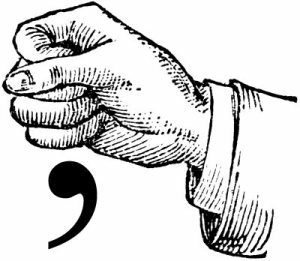 A recent Wall Street Journal article by Henry Hitchings (“Is This the Future of Punctuation! ?”) delivers a lighthearted history of punctuation marks and also discusses some others, historic and current, that I have never heard of. The interrobang , for instance, is a combination of an exclamation mark and a question mark. According to language expert Michael Quinion, a New York City ad agency invented it in 1962. Interesting, but most of us find it hard enough to keep track of the punctuation marks we already use. But if you’re among the many who have trouble remembering whether to write it’s or its, or when to use a comma, a dash or a semicolon, there’s no reason to get your shirt in a knot over it. Just hire an editor to get it right for you. Hitchings’s latest book, The Language Wars: A History of Proper English, has just been published.